Polish Estimote, a retail proximity marketing service which was founded by Jakub Krzych and Lukasz Kostka, prepares to launch and transform the in-store shopping experience by harnessing the internet and smartphones to offer shoppers the ability to instantly obtain information about products and deals. It also allows for automatic purchases through the store app. I spoke with Krzych and he told me about their investors and their plans for the future. Although they are just now launching, Estimote has already attracted attention from TechCrunch. Krzych tells me that the service offers customers of a particular store an enhanced experience by allowing them to download an app and have information about particular products more readily available. For example, he suggests that you could enter a furniture store, focus your smartphone on a particular couch, and view an image of it, read more about it, add it to your cart, or pay and order shipping. The highlight of the service is their beacons, which can be placed anywhere to allow for precise location targeting (micro-location). They enable customers to wirelessly connect with the store through low-energy Bluetooth transmitters, which can last up to 2 years on a single coin battery. 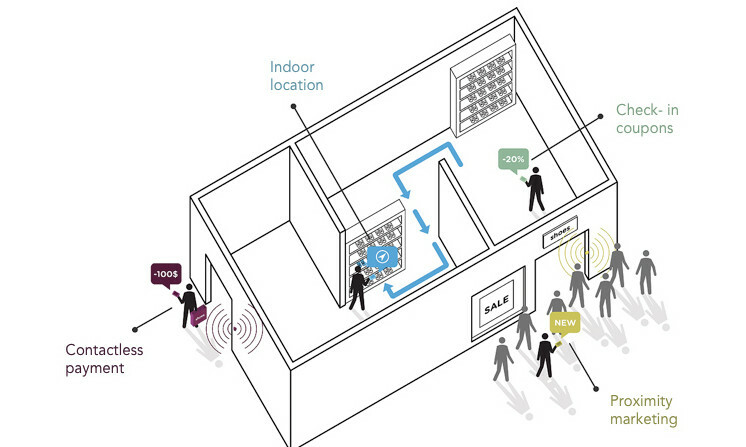 Estimote is a summer 2013 YCombinator participant. Krzych says that they have previously been backed by European and American investors, but that they have now received additional funds from YCombinator, Start Fund, Andreessen Horowitz, General Catalyst, and Maverick Capital. In terms of monetization, Krzych says that they are planning to build a large sensor network and that they don’t have all the answers to this question yet and are in the process of figuring things out. However, they are currently taking pre-orders for their developer kits, which are $99 (75 Euro). According to Krzych, the company is currently piloting their service in Europe and the United States, although we don’t have any more specifics than that at the moment. In terms of competition, Krzych emphasises what is so special about the service: they do not automatically track user data, but offers users the choice of opting into the service by downloading an app, which sets the startup apart from other services, which automatically tap into smartphones through Wi-fi scanners. Last month, we wrote about Russian service Synqera, a service which taps into smartphones to boost the in-store experience and which recently received a bit of press in the New York Times. Although likely not a direct competitor, both attempt to improve the in-store experience by using mobile technology to offer deals, advertise, and to encourage shoppers to become repeat customers.